Click for a somewhat bigger version. Google Fiber plans to start offering gigabit service in a handful of Austin neighborhoods in December. That’s the word from a press conference held by Google earlier today. Details are sketchy so far – all I could find in the way of coverage this afternoon was a brief write-up on a website published by a local newspaper, Community Impact. Lanane reported that Strama did not say how much Google is going to charge for the promised gigabit-level service, but that at least one element of the Kansas City package will remain on the table: pay a $300 connection fee and get “free” Internet service – 5 Mbps in KC – for a period of time. It appears that, as in Kansas City, Google will focus on building out in Austin fiberhoods where a sufficient number of residents have ordered service. Google is not putting universal service on the table. It clearly is cherrypicking affluent neighborhoods. But the impact of Google Fiber on the Austin market is more widespread. It’s no coincidence that AT&T just announced it is offering actual gigabit service there – as opposed to its Gigapower gigaweasel – although, like Google, availability is more limited than you might think. In AT&T’s case, only those homes – primarily recently built ones – with direct fiber connections qualify. Lots of questions to answer still. But at least we now have a deadline to watch. 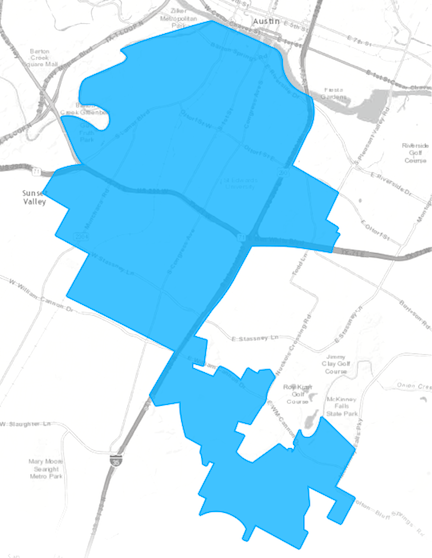 Is Google Fiber making a power (zone) play in Austin? Google has finally broken ground in Austin, Texas for its third fiber-to-the-home project. The announcement came in a blog post, complete with a couple of pictures that show guys boring a hole in the ground for conduit and doing something – it’s not clear what – with a power transformer on a utility pole. Yes, the guy in the bucket truck is working in the power zone – the area of the the pole reserved for electrical distribution. Communications cables usually run lower, where less rigorously trained (and expensively paid) technicians can operate safely. It’s possible to run fiber optic cables alongside power lines – PG&E does a lot of that here in California – but that’s not where telecoms companies do their work. I’m not sure what it means (and not ruling out that I’ve just missed the obvious until now). Could be the guy is just doing some routine make-ready checks and needed to take a look at something in the power zone. Or he’s installing an electrical connection for Google’s equipment and whoever wrote the the photo’s caption – “Making room for Google Fiber on Austin’s utility poles” – doesn’t understand the difference. Or, it could be something more interesting. Like maybe Google is partnering with Austin Energy, the municipal electric system that serves the City of Austin and surrounding areas. There’s nothing new about municipal electric utilities getting into the fiber business. Several California cities have done so, although not yet for FTTH purposes. But Provo, Utah did, and sold the system to Google. It’s not a novel idea, even for Google. What would be new, though, is Google working with a city utility department on a completely new overbuild. Taking advantage of (relatively clean?) pole routes owned by a city would lower expenses by a ton; having the work done and the system operated by company with Google’s cost structure and scale would drop the tab even further. Google is promising more details on 15 October 2014 – maybe their strategy will become clearer then.